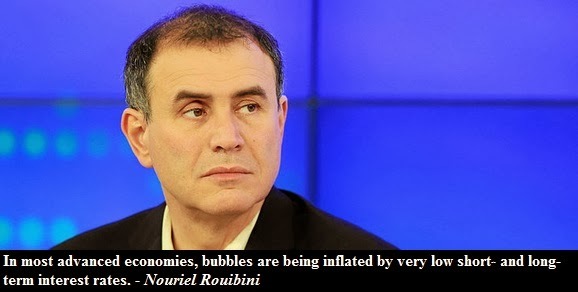 In his recent piece Roubini pinpointed "signs of frothiness, if not outright bubbles" in Canada, Norway, Sweden, Switzerland, Finland, France, Germany, New Zealand, Australia, Hong Kong, China, and Israel. "In most advanced economies, bubbles are being inflated by very low short- and long-term interest rates. Given anemic GDP growth, high unemployment, and low inflation, the wall of liquidity generated by conventional and unconventional monetary easing is driving up asset prices, starting with home prices"
According to Roubini, signs of entering bubble territory include rapid real estate appreciation, high and rising price-to-income ratios and high levels of mortgage debt as share of household debt. Canadian home prices rose over 125% since 2000. According to OECD the price-to-rent ratio was 68% above the historical average while the price-to-income ratio was 32% above the long term average. 64% of all household debt was mortgage debt in Q2 2013. "With central banks – especially in advanced economies and the high-income emerging economies – wary of using policy rates to fight bubbles, most countries are relying on macro-prudential regulation and supervision of the financial system to address frothy housing markets. That means lower loan-to-value ratios, stricter mortgage-underwriting standards, limits on second-home financing, higher counter-cyclical capital buffers for mortgage lending, higher permanent capital charges for mortgages, and restrictions on the use of pension funds for down payments on home purchases." And that's exactly what Canada is doing. In 2014 some expect the elimination of 30-year terms for mortgages with down payments of 20% or more. The table below shows sample history of CMHC program changes. Finally, Roubini does not expect the new housing bubbles to burst just yet as the globe is flooded with easy money. Nevertheless Roubini says: "But the higher home prices rise, the further they will fall - and the greater the collateral economic and financial damage will be - when the bubble deflates." You can view the emerging housing bubbles below.